The generosity and vision of foundations and private individuals, alike, make the important work of the Center for Jewish Studies possible. Our major donors include the Helen Diller Family Foundation, the Neufeld-Levin Chair in Holocaust Studies, the David B. Gold Foundation, and the Koret Foundation. If you would like to make a donation to the Center for Jewish Studies at UC-Santa Cruz, please contact Cari Napoles, Director of Development for the Humanities Division, by phone: (831) 459-4713, or by email. To make a secure web donation to the Center for Jewish Studies, please visit UCSC Online Giving. 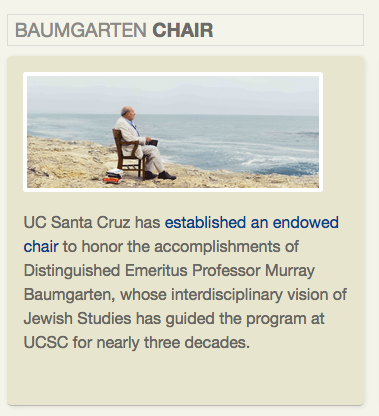 The Baumgarten Endowed Chair in Jewish Studies will honor the accomplishments of Jewish Studies scholar and teacher Murray Baumgarten, whose interdisciplinary vision of Jewish Studies has guided the program at UCSC for nearly three decades. The Baumgarten Chair will lead a Jewish Studies Program at UCSC that is committed to educating the university’s diverse student body in the core values and rich history and culture of Jews from the ancient to the modern periods and from the corners of the Diaspora to the modern State of Israel. Curriculum is continually customized as faculty responds to new research or student inquiry fueled by access to digital archives and global events. Students are drawn to UCSC studies in the Jewish experience seeking an understanding of their own identities, a concern for tolerance reflected in their own experiences, the meaning of community and how their lives will serve to better heal the world and solve problems that range from peaceful co-existence to environmental respect. Jewish Studies classes are among the most sought after by undergraduates, both Jewish and non Jewish, who study the history, music, theater, film, literature, languages, philosophy, impact and contributions of the Jewish people. Non-Jewish student enrollments in classes are increasing in part because of how class content is presented and discussed. Undergraduate student enrollment in classes and activities could continue to increase particularly for non Jewish students seeking to understand questions of residential and cultural identity, immigration, and inclusion. Undergraduate degree curriculum and requirements for the current major and minor in Jewish Studies would be further developed or expanded through the leadership of an Endowed Chair. Distribution of lectures, seminars, colloquia, publications and programs to wider audiences, through existing and new online models, would be assessed and developed through the initiatives of an Endowed Chair. Collaborations with other regional, national and multi-national Jewish studies research or programs would be secured for UCSC students and faculty, through the leadership of an Endowed Chair. If you would like to make a donation to the Baumgarten Endowed Chair in Jewish Studies, please contact Cari Napoles, Director of Development for the Humanities Division, by phone: (831) 459-4713, or by email. To make a secure web donation to the Baumgarten Endowed Chair in Jewish Studies, please visit UCSC Online Giving.